Valve hates the PS3. Well, Gabe Newell hates the PS3, and since nobody else had ever said otherwise, we just figured it was company policy. Times, though, times change! Valve's Doug Lombardi has told CVG that, since the PS3 started shifting a few more units, they've stopped hating on it, and started to "take it seriously". Funny how that happens. 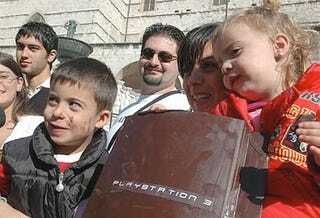 And it's not just the PS3 they're warming to. The Wii has, last time we checked, sold a ton of units as well. Same story, then? If we were going for the Wii we'd have to go for a whole new game that's designed for that platform. That's an expensive proposition and riskier than just getting some good PS3 developers on board. It's something that we're still evaluating, but certainly the install base is the thing that rules all. If there's an opportunity there you've got to take it seriously.